Hello, all you girls and ghouls! 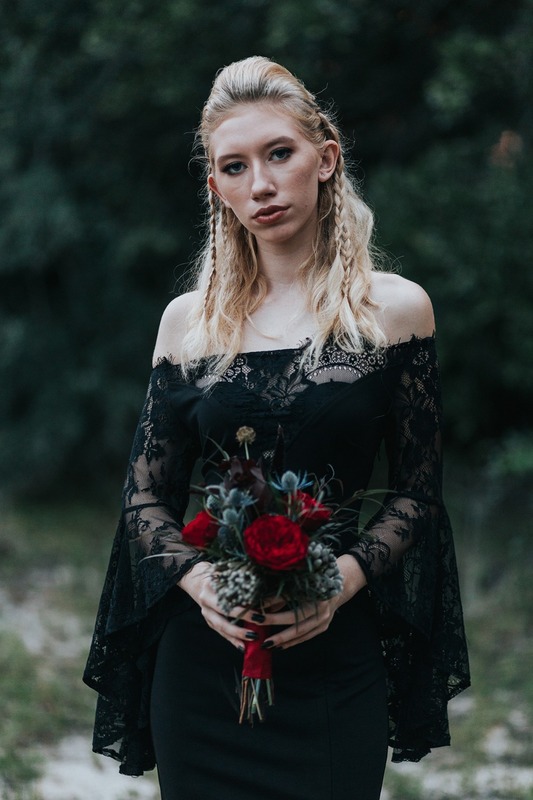 It's Halloween and we have THE PERFECT wedding inspiration for you on this spooky October day. 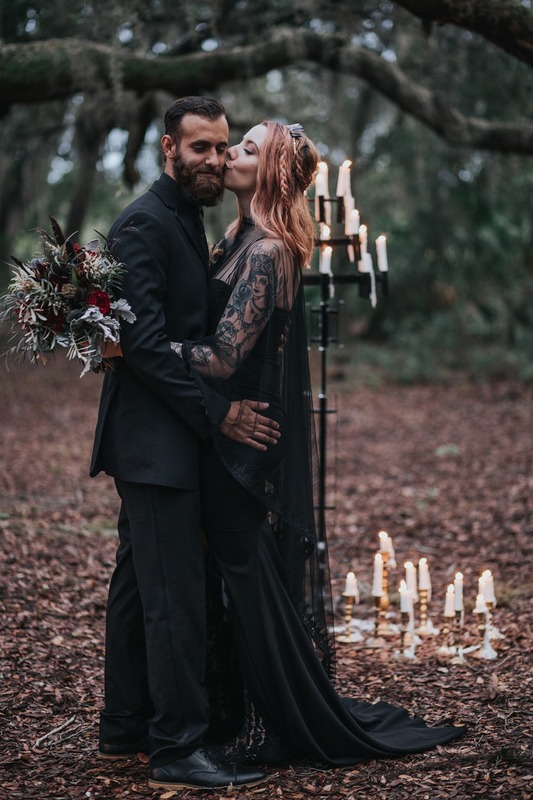 Dreamed up by Angie & Marko Photography, This binding ceremony/wedding day includes actual Wiccan ceremony elements and spells! So whatever you do, be careful where you wander off to in this enchanted forest. 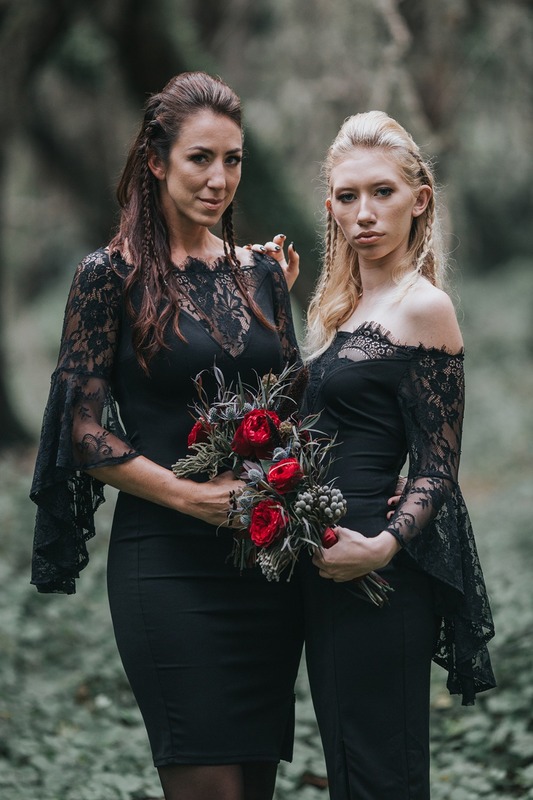 For more witchy wedding ideas keep scrolling, you'll love the topsy-turvy wedding cake and we cannot get enough of this wedding parties look! 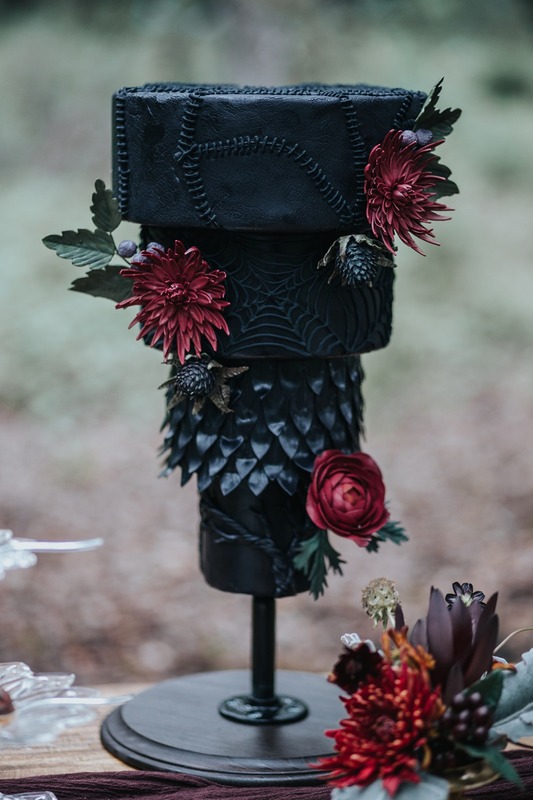 Oh and find out what sort of flowers were used to give this day it extra haunting vibe! All this is just a few scrolls away, plus even more photos in the full gallery! 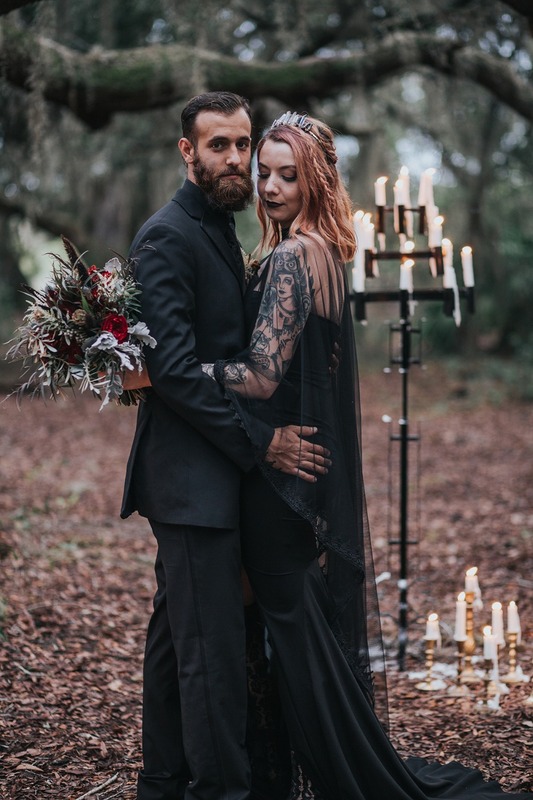 This Wiccan wedding inspiration (Binding Ceremony) was inspired by both the modern witch and a twist of the 1800's Salem witch era. 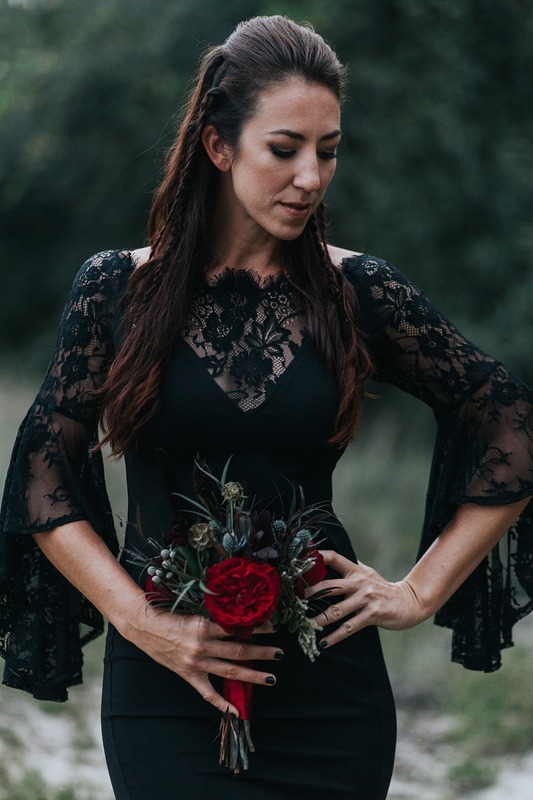 We wanted to create an elegant and mantic Halloween wedding theme that resonated with brides who want to have a unique take to their wedding. 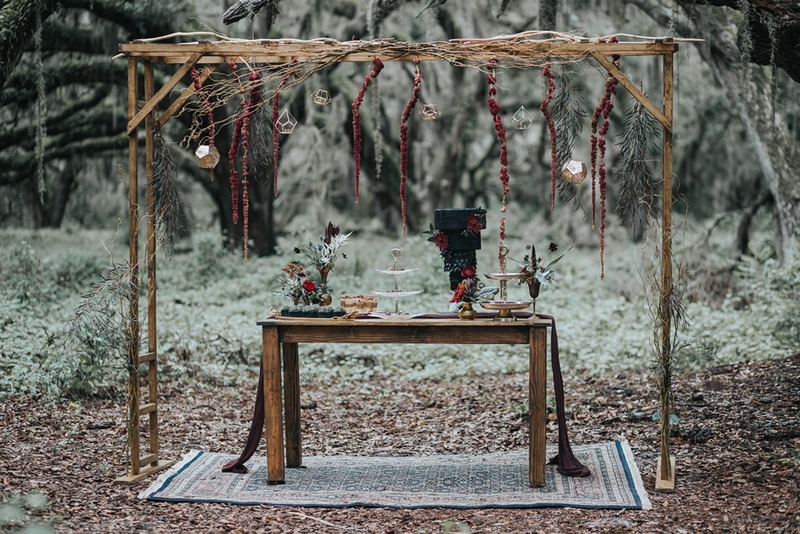 We made sure that everything we showcased was an accurate depiction of a real binding ceremony. 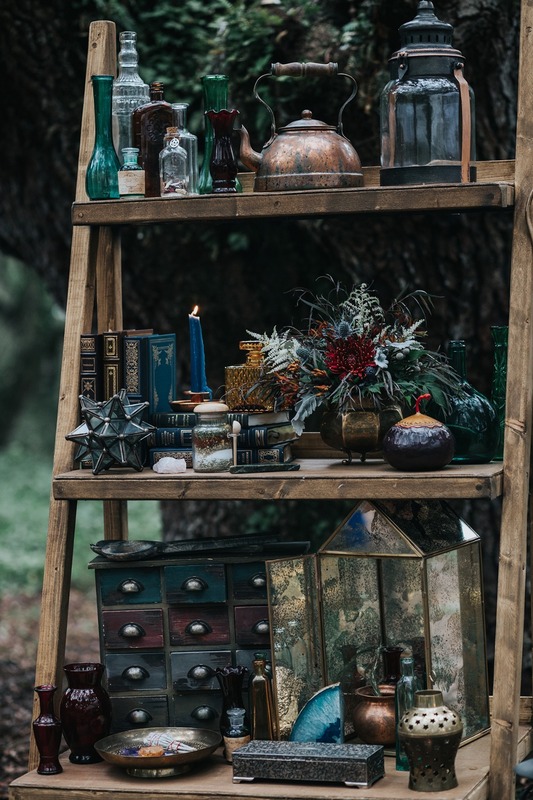 All the items showcased are items that are used by real modern day witches and all the writing on signs and stationery are real spells. 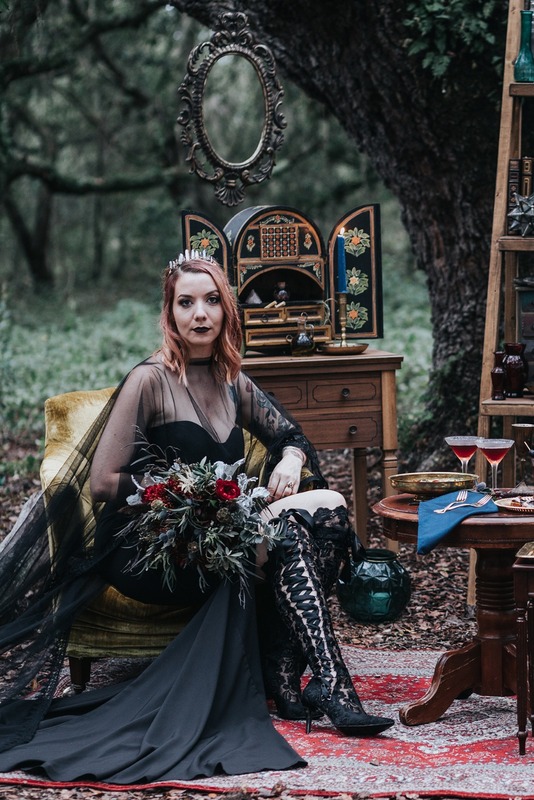 This Witchy Wedding was filled with fog, vintage distressed pieces and lots of small details to really showcase a witch's lair. 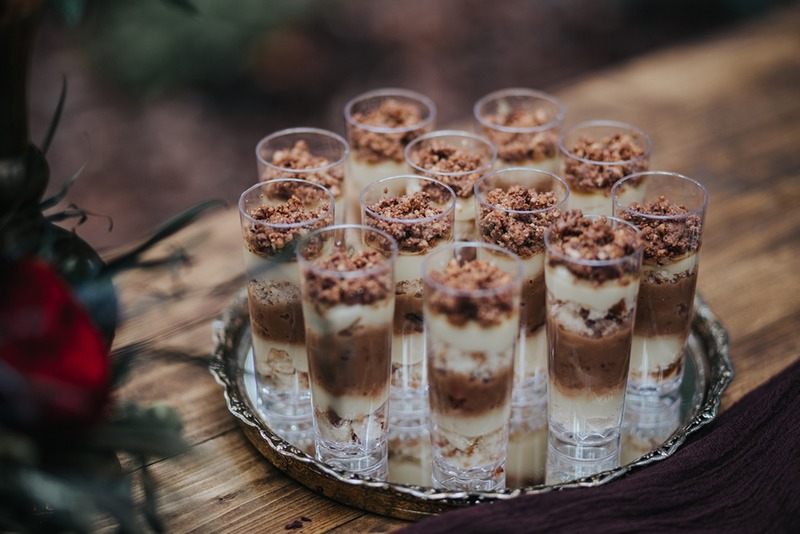 Before arriving at this celebration you were invited via a moonlight ritual. 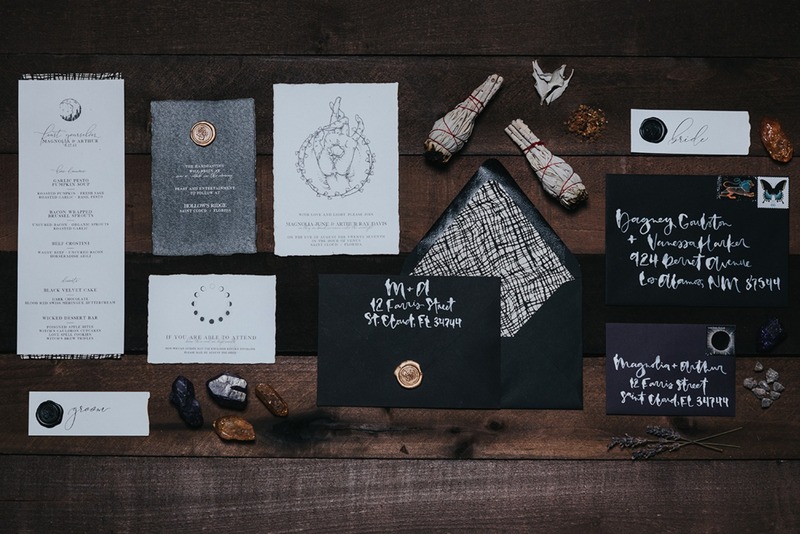 The invitations by Hands of Hollis depicted a Wiccan ritual for the rsvp cards and had witch inspired illustrations. 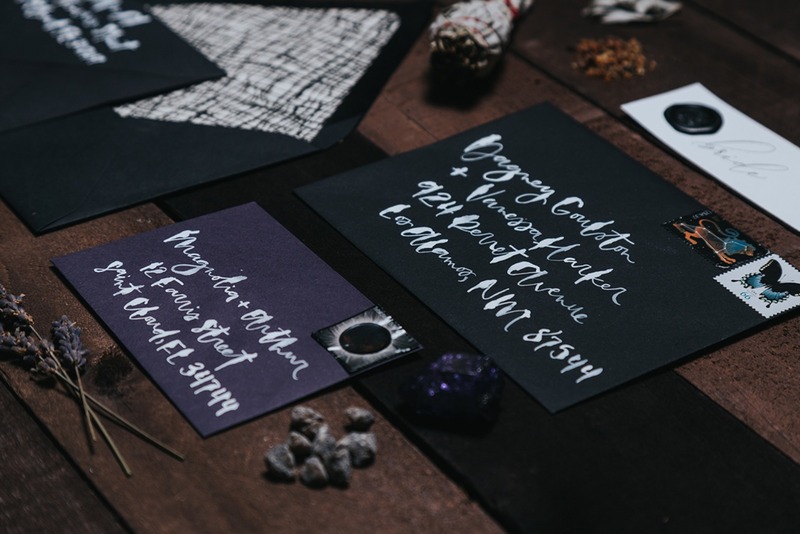 The envelopes were hand-lettered and illustrated in white ink by the wonderful calligrapher Happy Kelsey Clark. 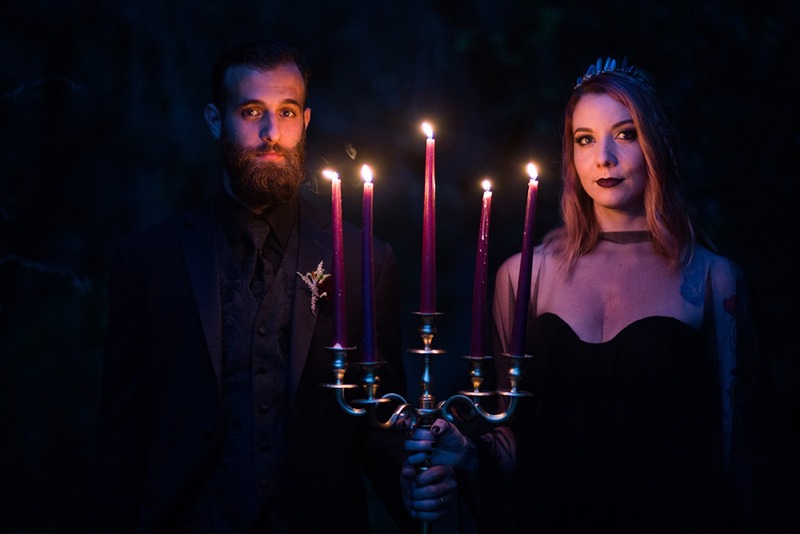 The spell candles photographed with the stationery were provided by Mooncrafted Essentials and served as wedding favors for the guests. 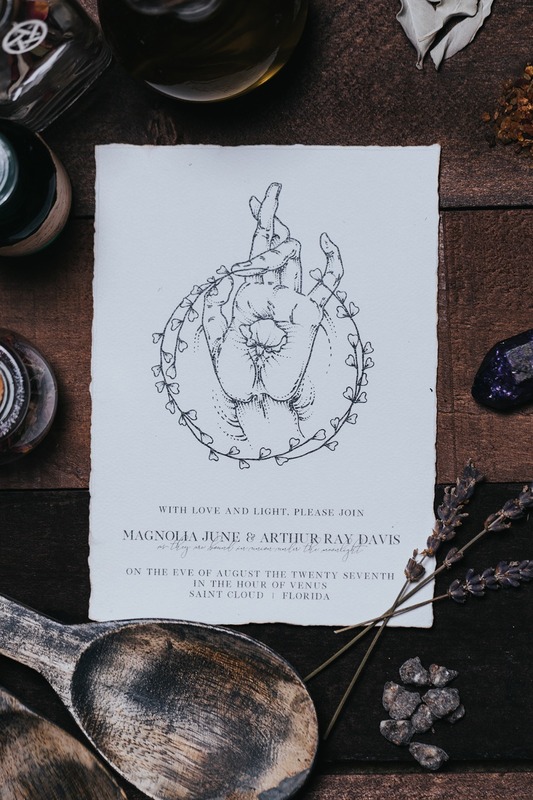 The wonderful handmade rings from RAW by Olivia Mar truly tied the knot at this binding ceremony. Made out of gold and set with a black tourmaline stone. 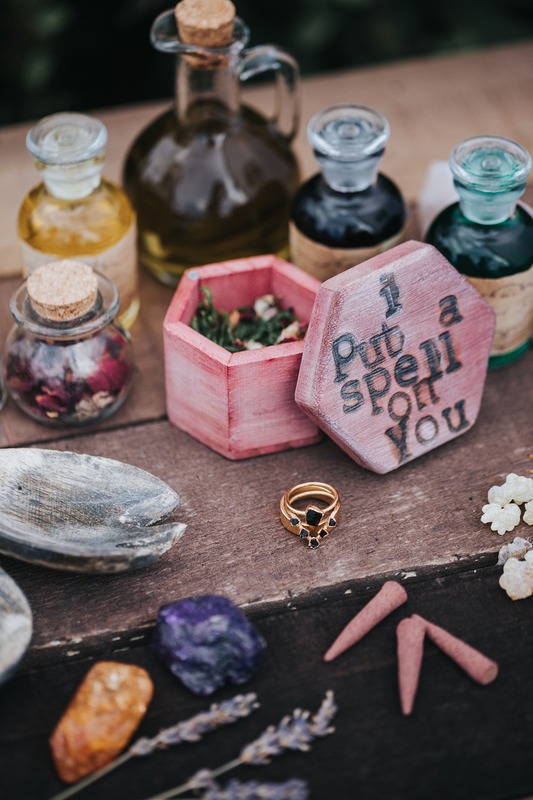 The Ring box provided by Wilding Apothecary was perfectly handmade, stained with hibiscus and blueberry tea and branded with the phrase I put a spell on you. 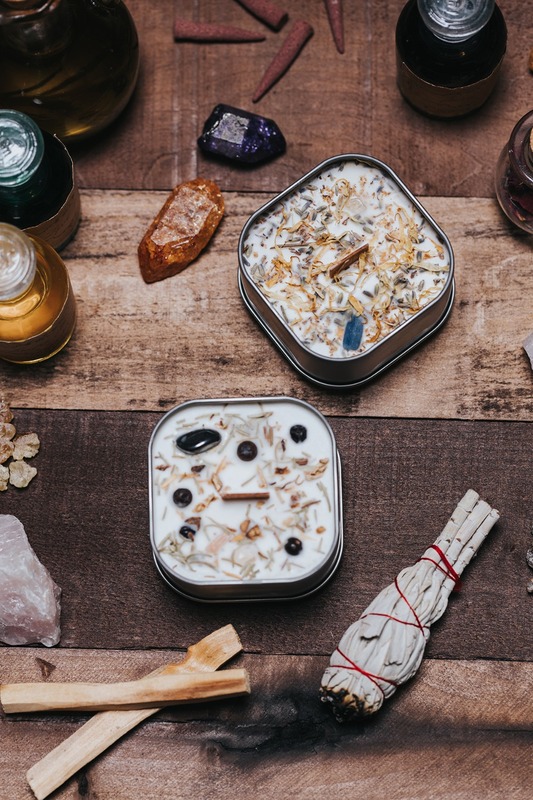 This was photographed surrounded by herbs, sage sticks, incense and potions provided by Left Over Hippies. 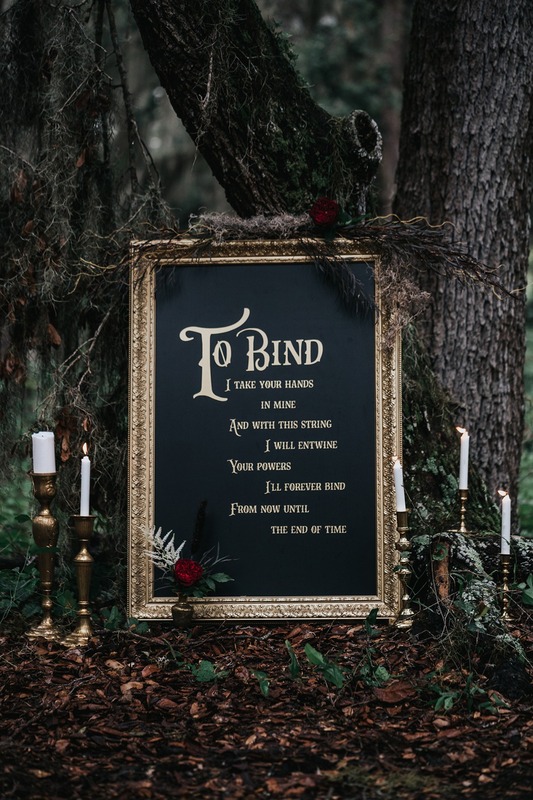 As you walked through the gloomy woods and entered this celebration a striking vintage sign welcomed guests with a binding ceremony spell. 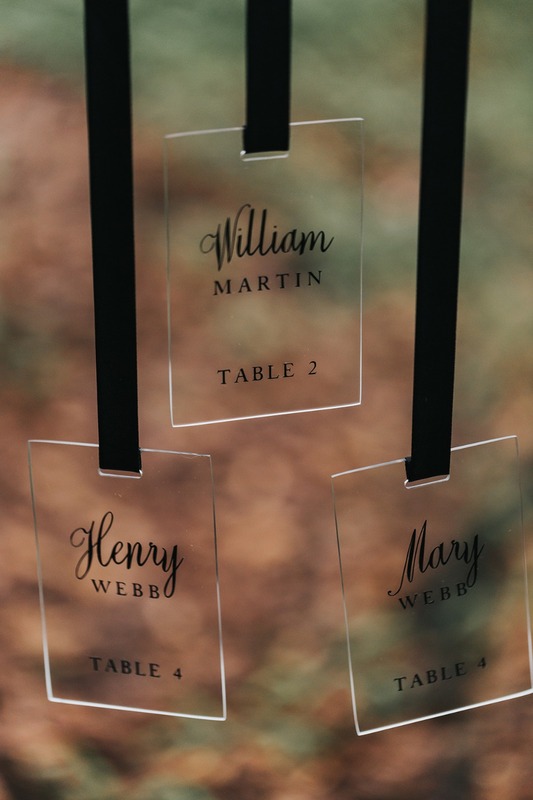 As you followed the path deeper into the forest, acrylic signs elegantly hung from a branch and displayed a seating chart made by Chic Signs. 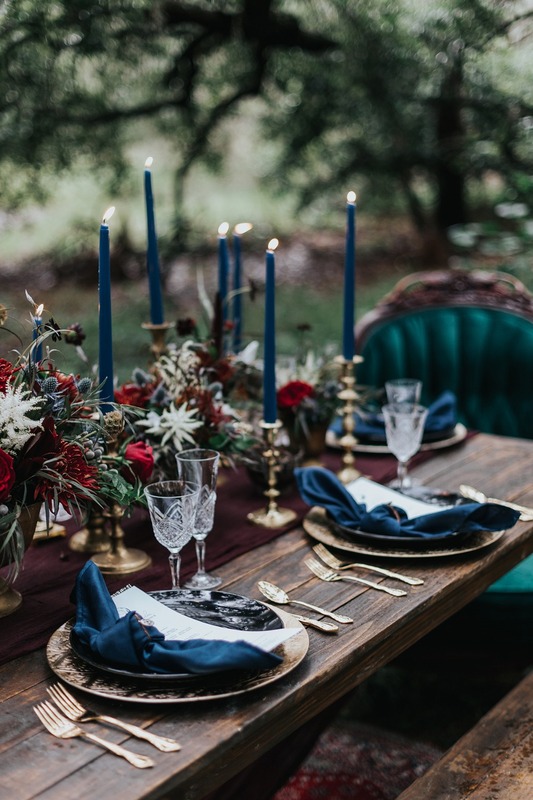 Rich jewel tones covered the Tablescape. 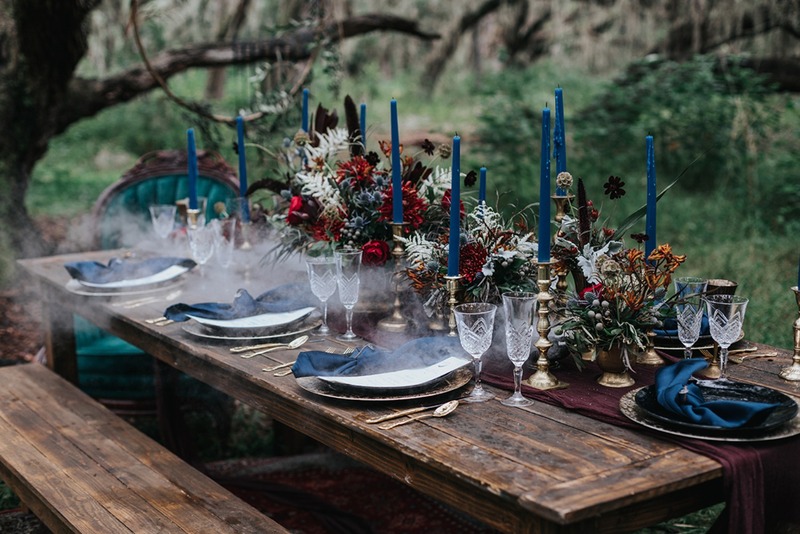 A rustic walnut farm table was styled with a flowing wine-colored runner, brass accents and two victorian velvet emerald chairs. 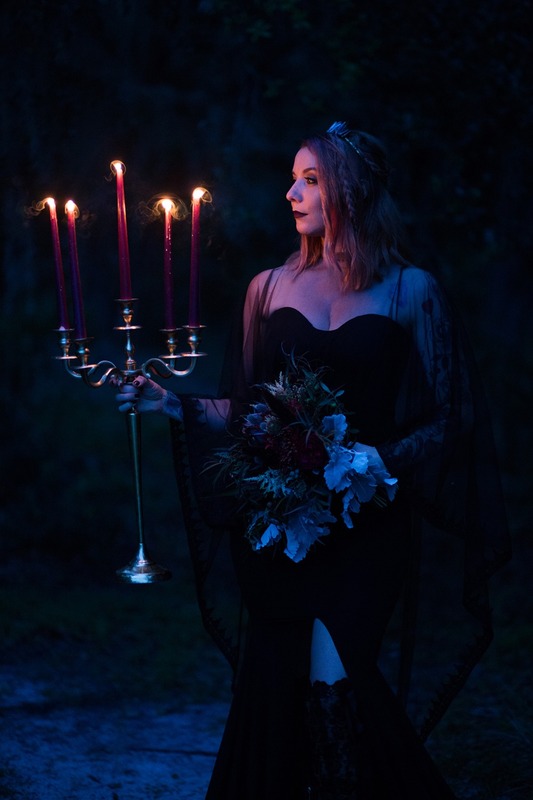 The blue candles in the Wiccan faith represent fidelity, good fortune, and harmony everything you want in a marriage. 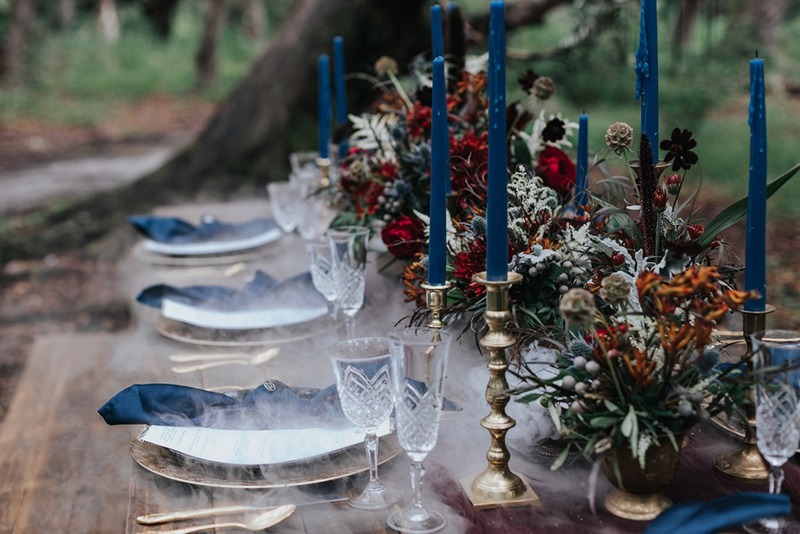 Dry ice created a low falling fog effect and really gave it a spooky yet elegant look. 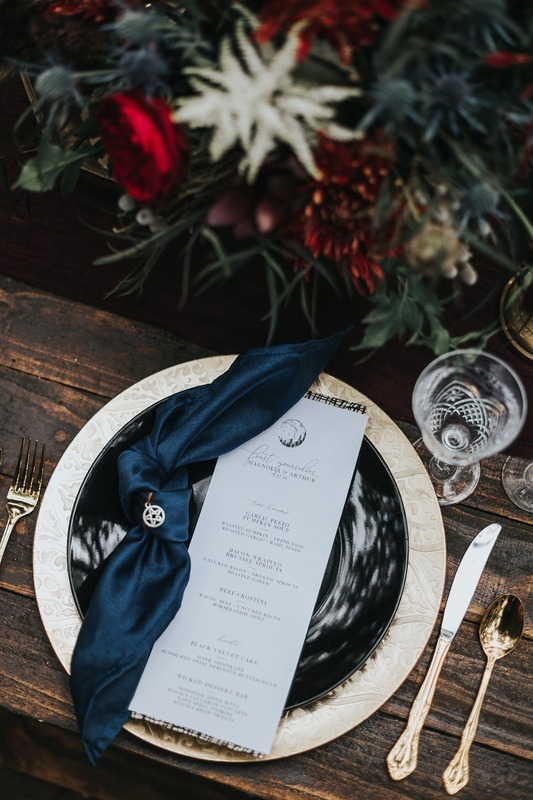 Gold ornate silverware, chargers and black plates were used for each setting. 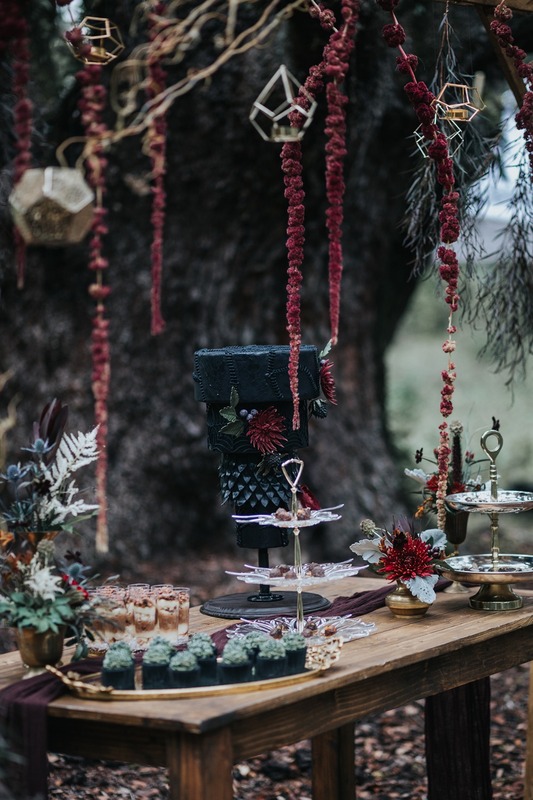 To tie it all in, floral circled arrangement rings hovered above the dining table. 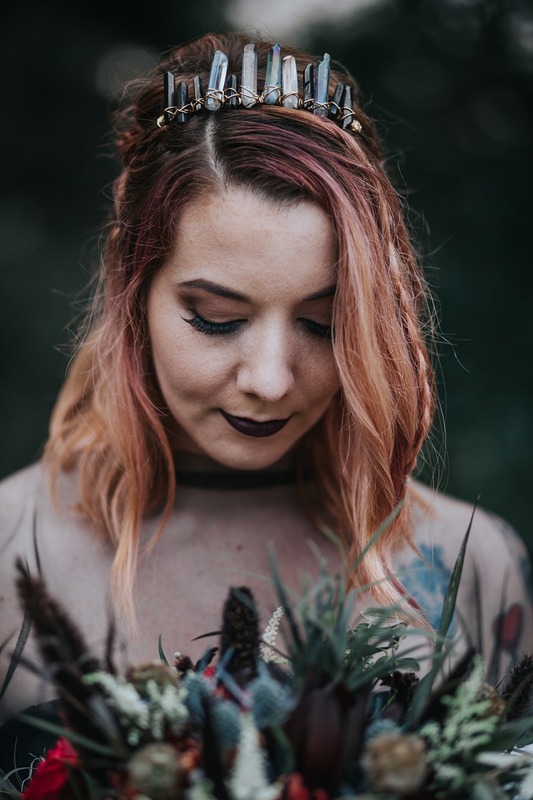 In the Wiccan faith, it is believed that magical circles are a form of protection. 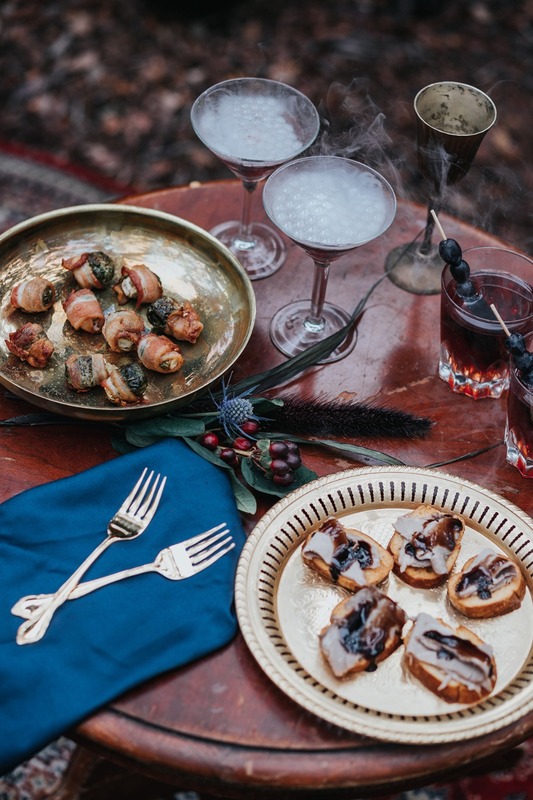 The menu by Two Chicks and a Pot Catering was mesmerizing, featuring Garlic Pesto Pumpkin Soup, Bacon Wrapped Brussel Sprouts & Beef Crostini. 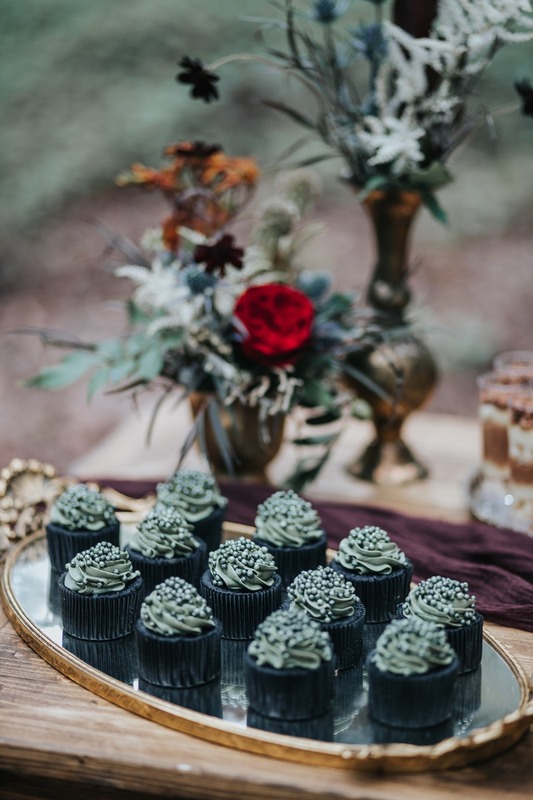 The Wicked Dessert bar by Sweet Miss V's was truly enchanting it featured Poisoned Apple Bites, Witch's Cauldron Cupcakes, Love Spell Cookies, and Witch's Brew Truffle. For the main dessert, we had a Black Velvet Cake made out of Dark Chocolate & Blood Red Swiss Meringue Buttercream. 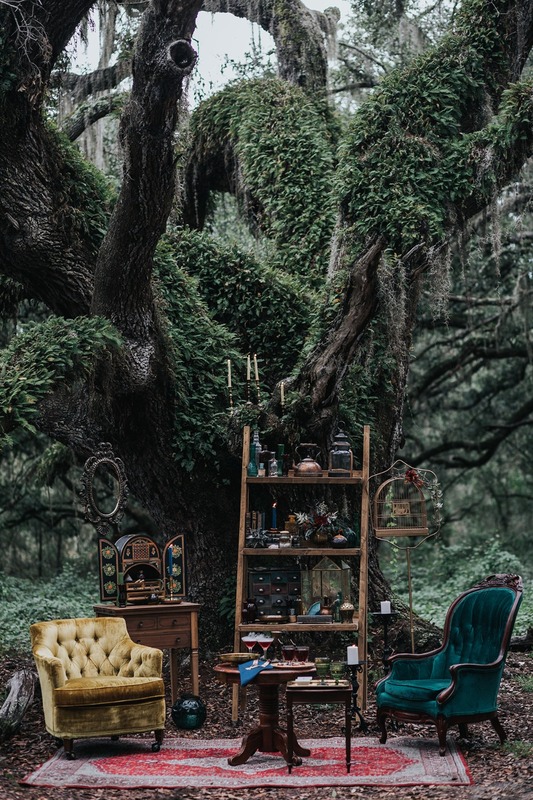 A towering tree covered in moss served as the dramatic backdrop for the lounge area. 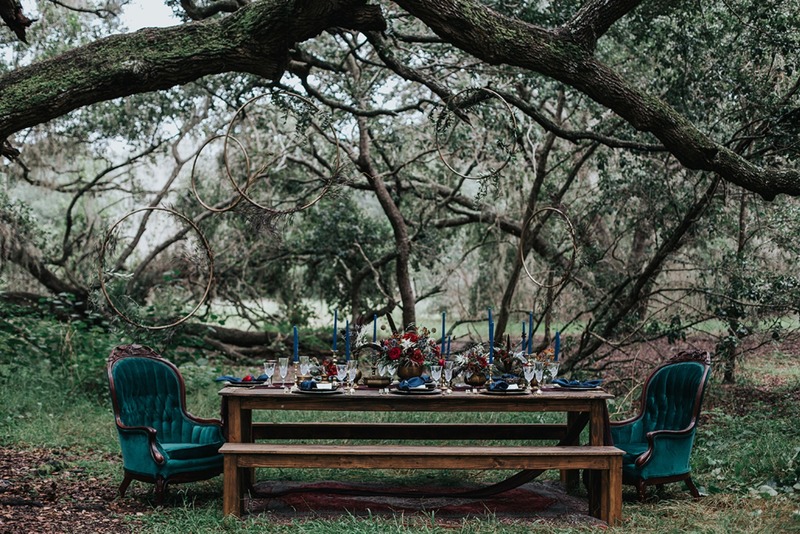 Ocean Hawks Rentals incorporated more than a hundred pieces to bring the eclectic scene to life. 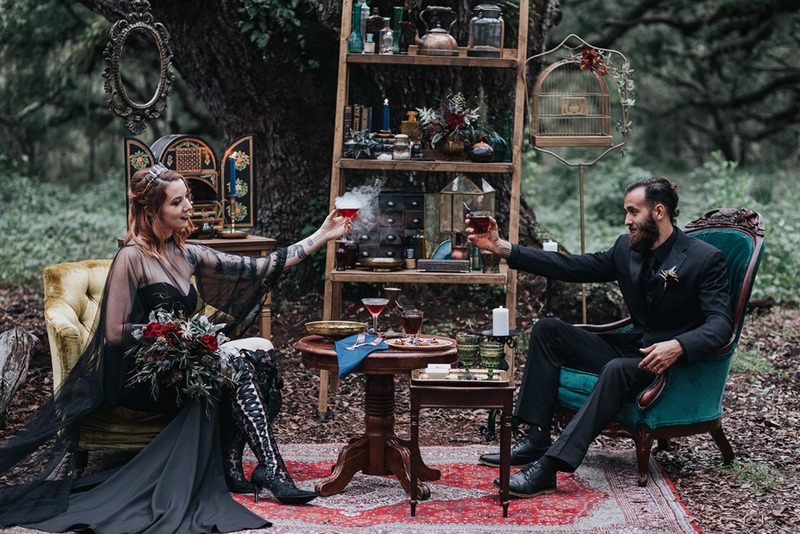 Jewel-toned velvet seating, distressed antique tables, and a vintage area rug were surrounded with a variety of props and the tiniest of unique details including a gold birdcage, farm wood shelf filled with old books, bottles, spells, and potions. 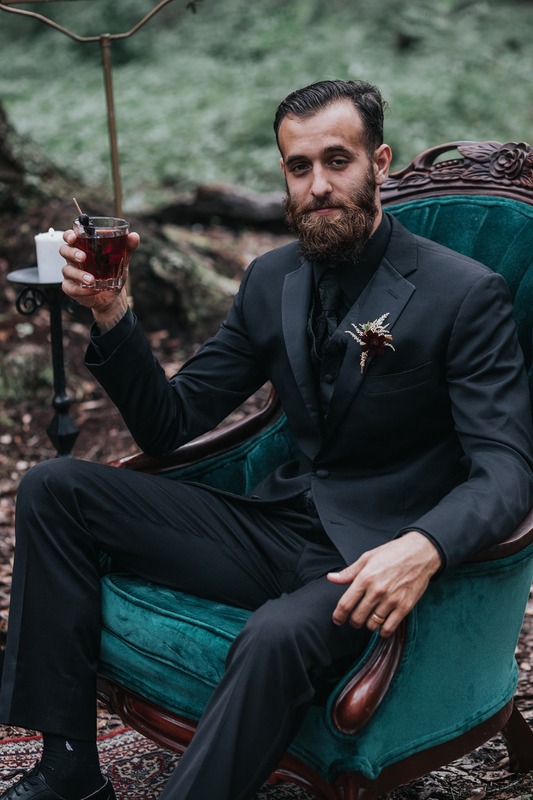 It was truly a magical spot to just sit back and relax with the enchanting cocktails that were crafted by two chicks and a pot catering. 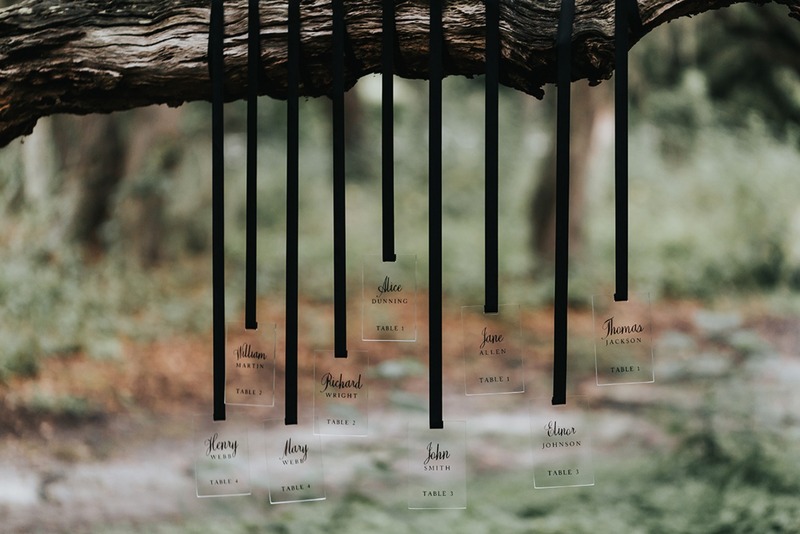 The ceremony took place in a sea of trees with draping moss, creating a one of a kind whimsical setting. 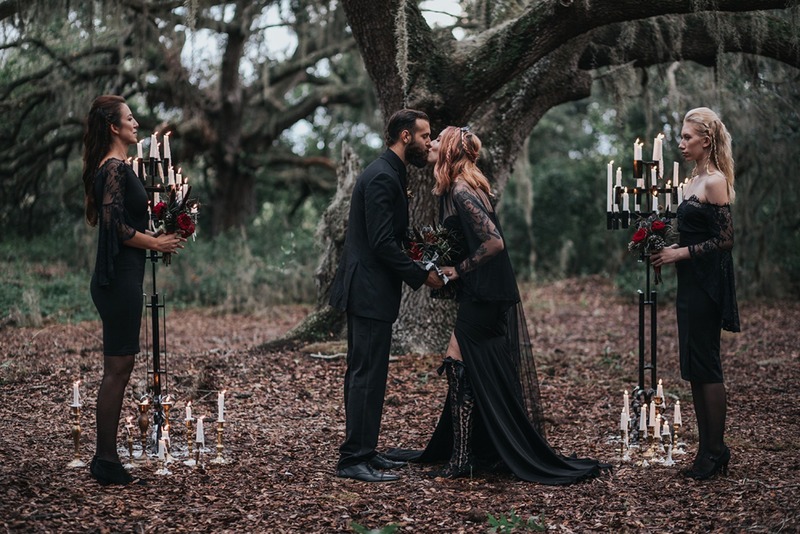 Two 6ft tall custom candelabras were welded to line the aisle for this scene as dozens of lit candles set the romantic mood. 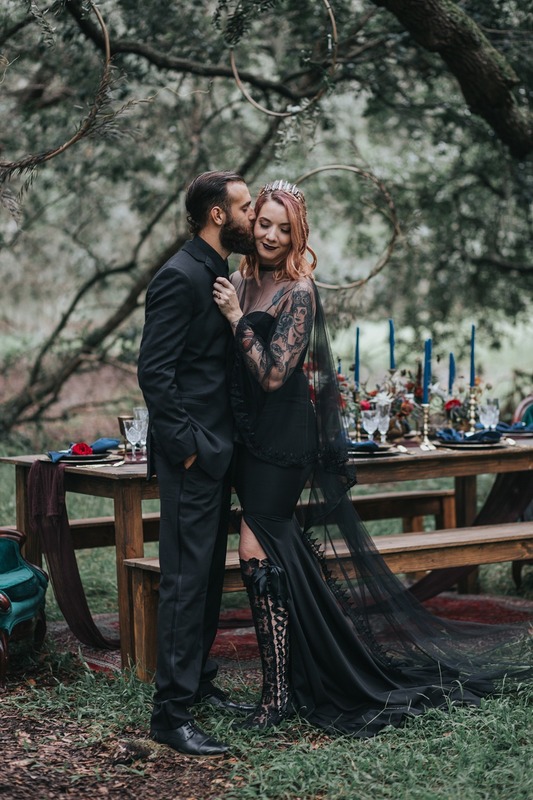 The entire wedding party wore an elegant black attire to this ceremony breaking all the myths that you can't wear black to a wedding. 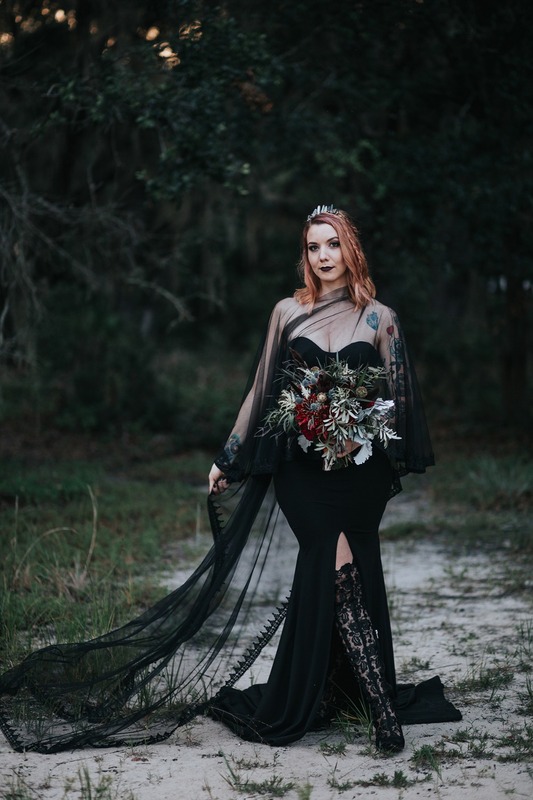 The bride opted for a modern bridal cape to replace the conventional wedding veil and wore a high slit form-fitting black dress that was complemented by Thigh High Lace Boots made by The House of Elliot Collection. 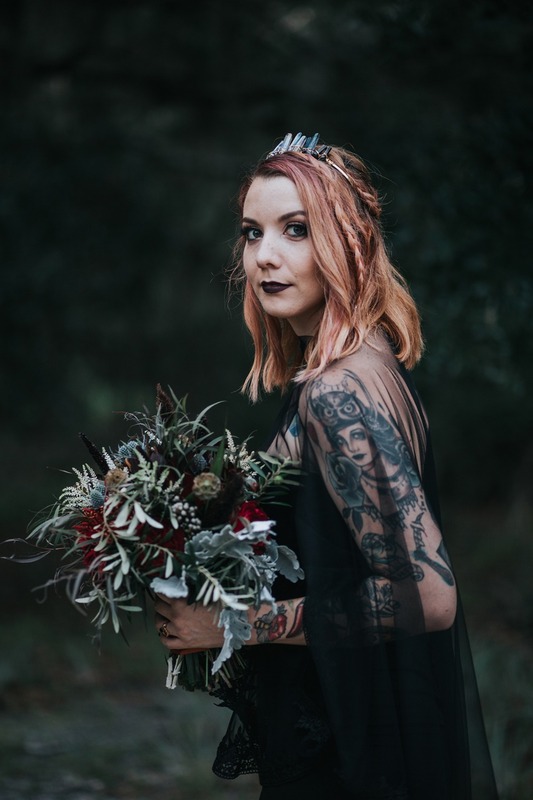 To top everything off she wore a quartz crystal crown by Wilding Apothecary. 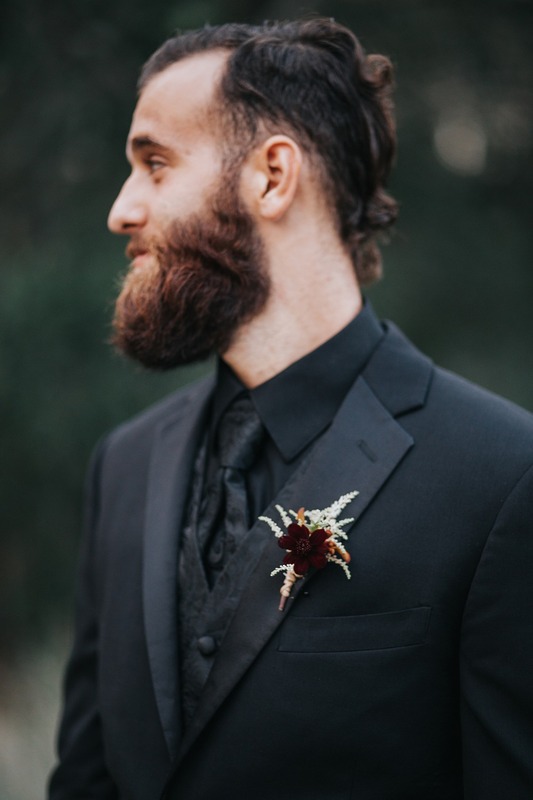 Our groom wore an all-black fitted tuxedo provided by Daytona Tuxedos. 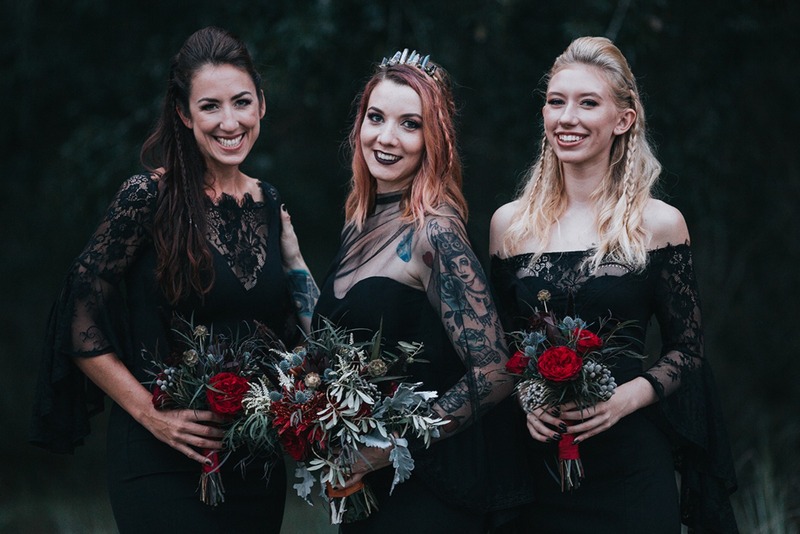 The bridesmaids wore short bell sleeve dresses with tights creating a classy timeless look. 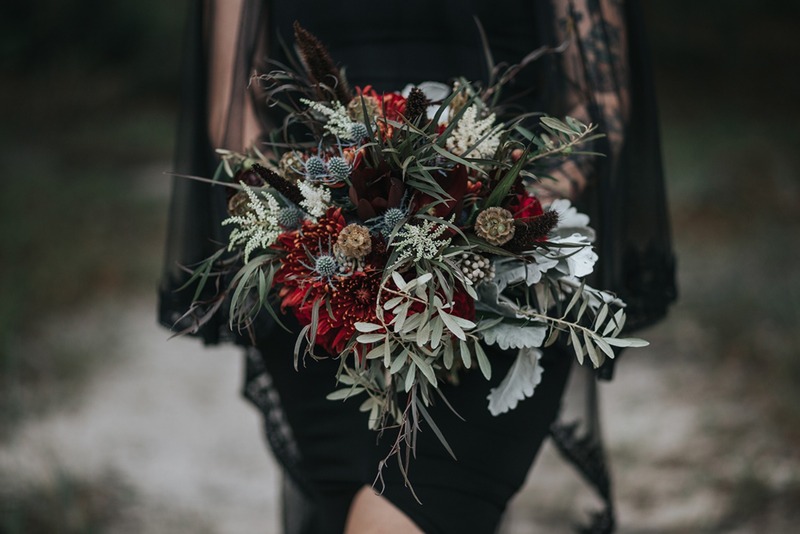 Moody florals to set the magic off included scabiosa pods, which are actually the remains of a once bloomed flower, thistle - almost like a rose with it's interesting beauty but pricking edges, Tess Garden Roses to bring in the boldness of our ladies, kangaroo paw for an accent, chocolate Cosmo's for a dainty yet bold touch with it's deep purple tones, agonies to accompany the purple tones and wispy nature, white astible to accent the dark tones, brunia and dusty miller for a touch of grey, olive branches which can be used for peace and seen as a sign of fertility, as well as hung over a door to keep evil away, hanging red amaranthus as seen from above delicious treats and is also said to be used for powerful protection in Wiccan folklore. Curly willow also fixed to the structure could be used to make brooms if needed. 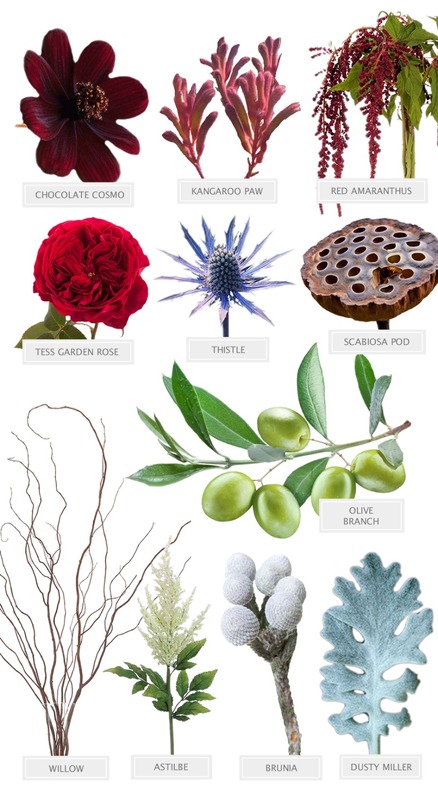 Flowers and herbs go hand in hand with Wiccan belief. 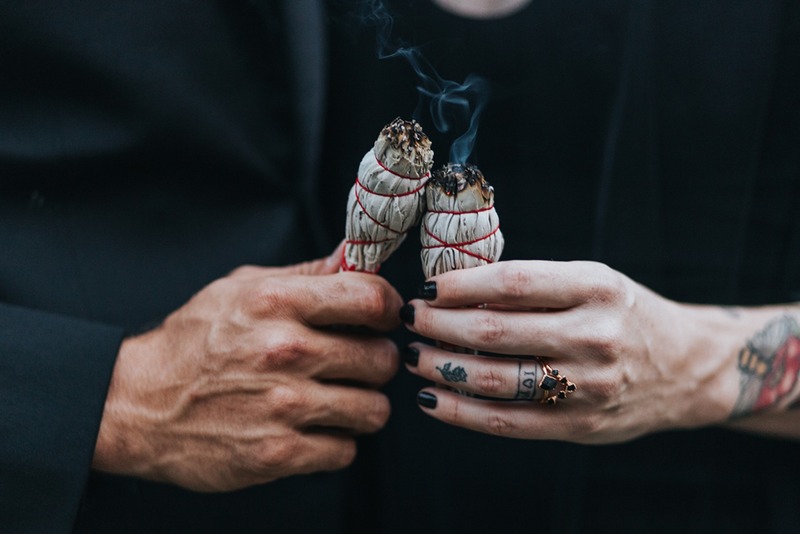 Whether to bring about good spirits, heal, or protect.